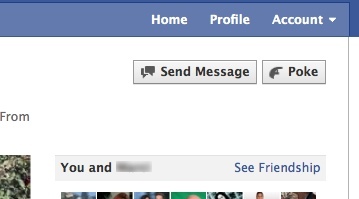 If you logged on to Facebook and discovered your profile is all wonky – fear not, it’s the new design! Facebook first made the upgrade optional on December 5th, but now all users are being automatically upgraded. 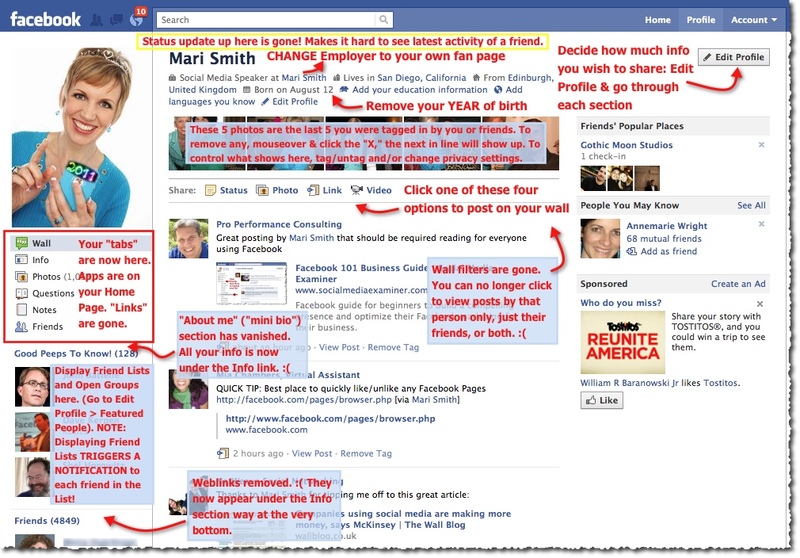 The good news is everyone on Facebook is facing the same learning curve with the new design. The not-so-good news is that you’re now stuck with the new design and there is no turning back, regardless of how much resistance some Facebook users put up. (I upgraded right away last month and have grown quite used to the new design). Weblinks no longer show on the left column; they now appear on the Info section waaaay down at the very bottom. Featured friends – you can add certain Friend Lists in this section. Go to Edit Profile and click “Featured People.” Or, click the edit pencil next to “Friends xxxx.” You can add any Friend List or any Open Group you already created (or you can create new Friend Lists). You can also reorder the lists with simple drag and drop. Be sure to save. IMPORTANT: anyone in a friend list that you choose to feature will get a *notification* that you added them to xyz list. 😉 You might want to just make sure you’re happy with the list name and who’s in it. Previously, Lists were always 100% private and only viewable by the owner. On your Info section, you may well see a whole bunch of “Community Pages” you didn’t know you were connected to. For more about what exactly these pages are, see this post. At the top of your new profile, make sure you’re happy with all the work/location/education etc. information. Edit/delete any info you don’t want displayed, or customize your privacy settings to only show certain data to certain people. Check your Employer – if you’re connected to a Community Page and it’s your company, go to that Community Page and claim it (click the link at the bottom left “Is this your business?”). You can choose to merge the Community Page into your existing fan page… or not. Change your Employer to be your actual fan page (recommended!). This part can be tricky! If the dropdown menu does not display your fan page to select from, the easiest way is to type in the full URL of your fan page. Or, if that doesn’t work, here is a step-by-step tutorial on how to do this. See also this helpful thread and screenshot. The five photos at the top of your new profile are the last five you were tagged in – whether you tagged yourself or a friend tagged you. Note: anyone viewing your profile sees these five photos. (Though I have heard some users say they see different photos than the ones the profile owner sees). To change the photos, mouseover each one and click the “X.” Another will automatically appear in its place. To control the exact five photos you want, untag then retag (or upload new ones) and tag from right to left (left is the most recent photo). For a fun profile “hack,” see this tutorial/app and these examples on Mashable.com. I hope this provides some support and clarity… the peace of mind part will come sooner or later! Remember, there’s nothing as certain as change and we all go through natural phases when phased with significant changes. Eventually, Facebook users get used to new features.